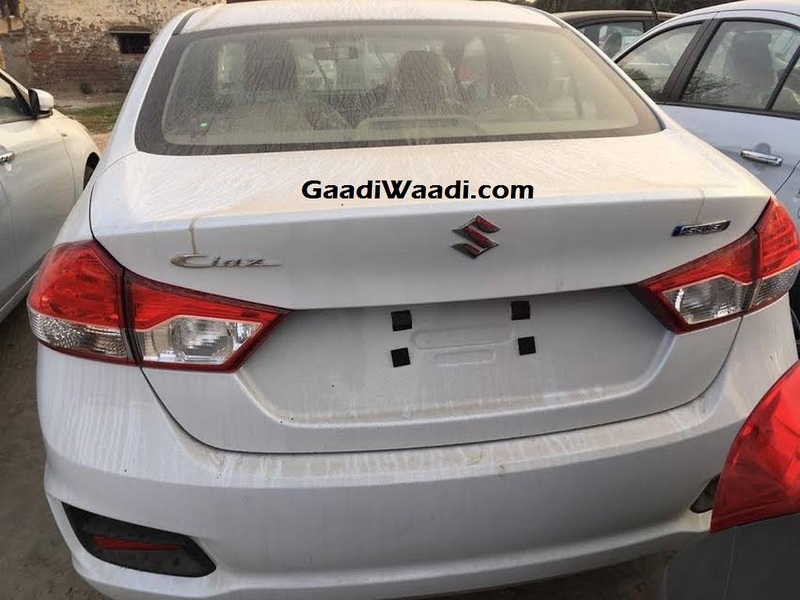 Just ahead of the facelift’s launch, Maruti Suzuki seems to have dropped the variant as well as Maruti Suzuki badge from the premium Ciaz sedan as you can see from the pictures posted. It does have the SHVS (Smart Hybrid Vehicle by Suzuki) badge though, understandably, as the Indo-Japanese pair has managed to cross over one lakh units of sales cumulatively with Ciaz and Ertiga since September 2015 equipped with the same technology. Expect to be priced around Rs. 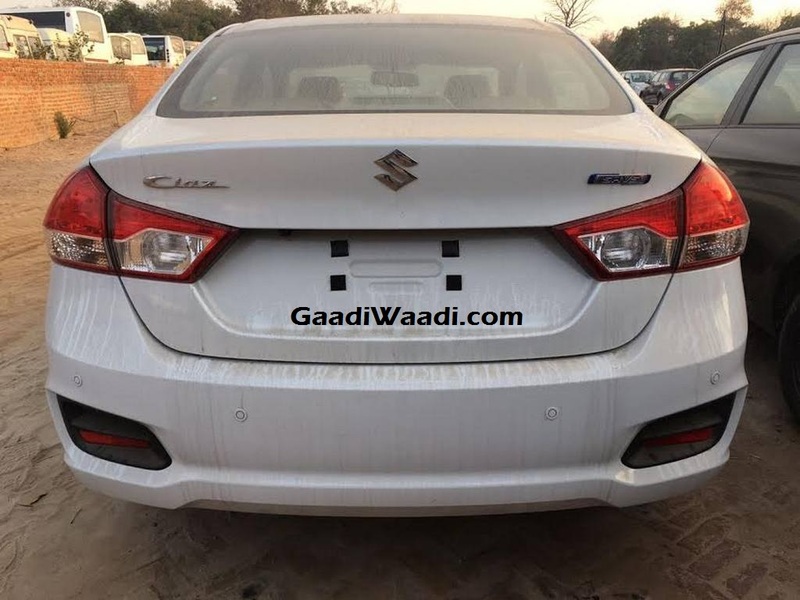 7.7-10.8 lakh, the Maruti Suzuki Ciaz facelift is likely to remain proportionally similar to the outgoing model. It measures 4,490 mm in length, 1,730 mm in width, 1,485 mm in height and has wheelbase of 2,650 mm. The luggage capacity at the back stands at 530 litres while the ground clearance is an appreciable 170 mm. It will be sold through Nexa premium outlets instead of regular dealerships. 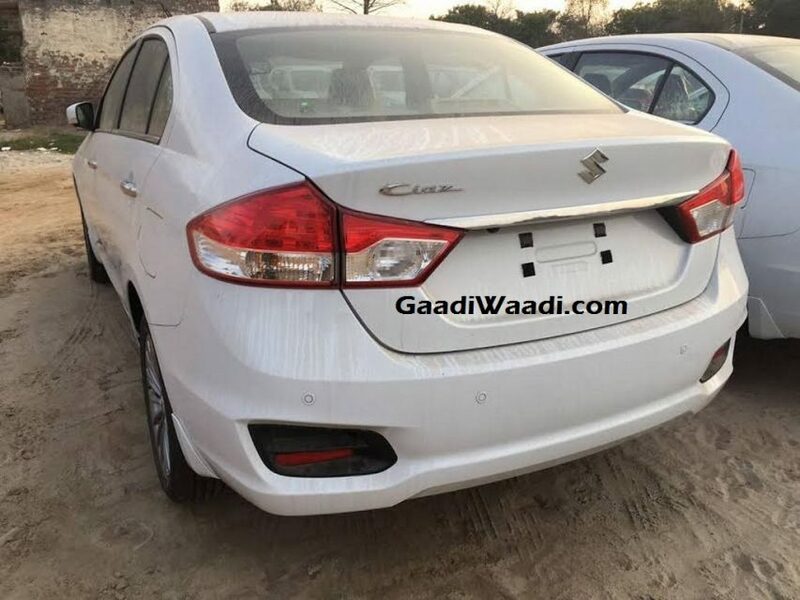 The facelifted Ciaz could come equipped with cosmetic modifications like revised grille, fog lamp housing and bumpers, inclusion of LED Daytime Running Lights, sunroof, newly designed alloy wheels, etc in a hope to elevate its premium nature. Moreover, it could get customisation packages like the new City while the top-end variants may get touchscreen infotainment system with Apple CarPlay and Android Auto connectivity, improved seat upholstery and so on. The existing Ciaz is powered by a 1,373 cc petrol engine that churns out 91 bhp at 6,000 rpm and 130 Nm of torque at 4,000 rpm. It is coupled with a five-speed manual transmission or four-speed auto ‘box in select variants. The diesel motor incorporating mild hybrid technology has 1,248 cc displacement and it develops 89 bhp at 4,000 rpm and 200 Nm of torque at 1,750 rpm. It comes linked with a five-speed manual gearbox only sending power to the front axle. A 1.6-litre diesel engine could be added to the lineup at a later time. The arrival of the facelifted City and the recently launched new Skoda Rapid has intensified competition in the mid-size sedan segment. With the new iteration of Ciaz and the upcoming Verna into the mix, we are in for an exciting year ahead.